The use of abrasives in an air stream in fossil preparation is well established and extremely effective. The refinement blasting can add to a specimen can be impressive, especially during the final finishing stages. While being an effective addition to the fossil preparation workshop these units are considerably less complex to both use and maintain than industrial level pressurised units. Despite their outward practical simplicity they are of a very high build quality with high specification industrial quality components and use a refined flow system. Produced by us they are designed specifically for use with the very fine powders and lower air pressures typically used for fossil preparation. In our experience many fossil preparers, especially those 'going it alone somewhat ' and responsible for the purchase and maintenance of their equipment, as well as its use, tell us they prefer these units to the complex though highly versatile pressurised types. We have sold countless dozens over the years and find them exceptionally reliable. Unusually for small relatively inexpensive abrasive blasters, these have an independent powder flow adjustment separate from the air pressure. An important, indeed a vital, feature for fossil preparation typically missing on similar priced units aimed at Dental or industry use. Powder flow is adjusted by a manual valve at the top of the unit, air flow by the self relieving regulator. The container is not under pressure, powder being drawn into the flow pipe by vacuum. It can be removed and refilled easily,. Nozzle size is a standard 0.062 inches. On off air flow switch is by a self relieving foot pedal for instant response. The spare container is a convenient holder for spare powder and gives balance and ballast to the unit. Despite the fact that the use of an airabrasive blaster on a specimen may represent just a small percentage of the total preparation time the end result can really set it apart. These units are especially effective for removing bruising from both fossil and matrix left by other means of preparation. Good too for the removal of deposits from intricate and complex fossils that are otherwise tedious if not practically near impossible to remove by other means. They can achieve an impressive result swiftly on very soft powdery rocks such as chalk and clays. An essential aid for many types of chemical preparation and also restoration techniques. 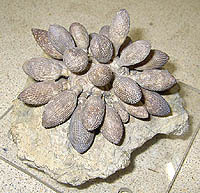 Some fossils are prepared most effectively with air abrasive techniques. Image show a distinct jurassic club spined Echinoid finish prepared with our fossil preparation blaster.